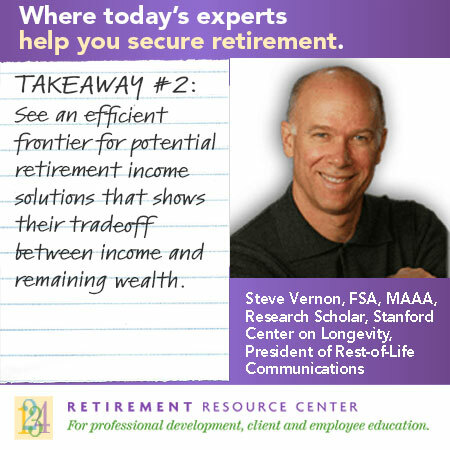 Takeaway #2: We compared 292 potential retirement income solutions. Our 2017 study, “Optimizing Retirement Income by Utilizing IRAs, Retirement Plans, and Home Equity”, is the culmination of several other projects that we have done jointly with the Society of Actuaries. If you look at the statistics, roughly there is the same amount of money in employer-sponsored retirement plans as in IRAs. Then there is about as much money in retirement savings as there is in home equity. Everybody is a little different in that mix, but we think that Americans are going to need to learn how to integrate all three of these sources as they approach the retirement years. In this study we have taken a portfolio approach toward combining these different sources. We put together a systematic comparison of different retirement income strategies and looked at viable solutions that are currently available in the DC marketplace, the IRA marketplace, and reverse mortgages. We did not dream up new solutions that are not yet available. We compared 292 different retirement solutions in our study. We looked at three hypothetical employees who are age 65: a single woman with $250,000 in savings, a married couple with $400,000 and a married couple with one million. Now, let us say right here that these statistics are above the median for older workers; these are a more affluent group in the workforce. We acknowledge that there are many, many, people with savings less than this amount, and they are going to be challenged in their retirement years. 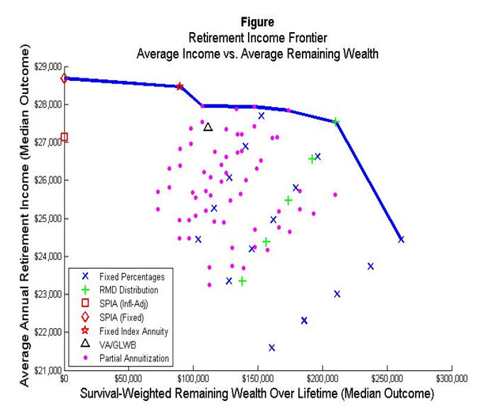 This chart shows the average annual retirement income expected per solution compared to the potential remaining wealth. 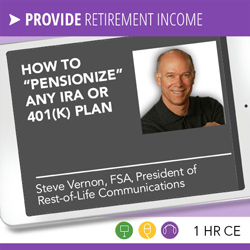 Every one of these different retirement income solutions has different shortcomings that some other method might address better. Then some other method might have its own shortcomings. In our analysis, we used stochastic forecasts of income and accessible wealth. From that, we developed an efficient frontier showing the amount of income versus liquidity. 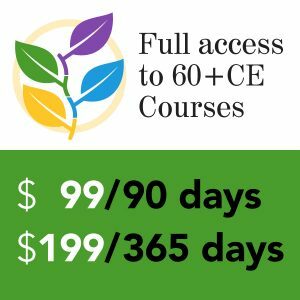 These are powerful tools that defined benefit plans used to define funding and investment strategies. Our assumptions reflected the current low-interest rate environment. We also compared institutional pricing that you might get through an employer or a plan sponsor. In a nutshell, optimizing Social Security and utilizing the RMD distribution, the key components of the easy-to-implement Spend Safely in Retirement Strategy, compared favorably to other more complicated approaches.